Classic potato salad is welcome at any picnic or backyard barbecue. This one is inspired by a recipe in my grandmother's copy of a 1938 cookbook, The American Woman's Cook Book. It says, "Boil the potatoes with skins on and allows them to cool before peeling, as it is considered a good thing to have potatoes waxy rather than mealy for salad." 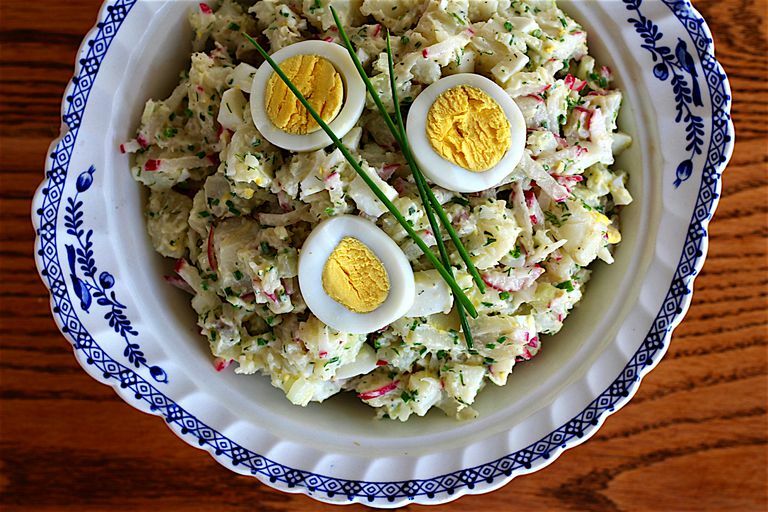 We extended that thought with our choice of red potatoes for the salad; we used chives and radishes instead of onions, to make it ​low-FODMAP; we added hard-boiled eggs for another classic touch. Scrub potatoes and eggs, place them together in a large saucepan and cover with water. Bring to a boil over high heat, then lower to maintain a low boil. After 12 minutes, remove eggs carefully with a slotted spoon and place in cold water. Continue boiling potatoes for a total of 25 to 30 minutes, until very tender when pierced with a fork. Cut the largest potato in half and check that the inside is also tender. You may remove the smaller potatoes early as they will finish cooking sooner. Drain potatoes. When the potatoes are cool enough to handle, use a paring knife to peel them; the skin should come away easily. Cut the peeled potatoes into 3/4-inch cubes and place them back in the saucepan. Sprinkle with lemon juice and oil and stir to coat. Allow the potatoes to marinate while you peel and dice the eggs and chop the other vegetables. Add the eggs, celery, radishes, dill, and chives to the saucepan. In a small bowl, combine mayonnaise, salt, and pepper. Add the mayonnaise mixture to the salad, and fold the ingredients together gently until combined. Transfer to a serving bowl and serve immediately, or chill, covered, in the refrigerator until serving. Try Yukon Gold instead of red potatoes. Replace radishes with one cup of diced cucumbers—they're just as crunchy and refreshing. To save time (and retain some extra fiber), leave the potatoes unpeeled. Cube them into bite-sized pieces before boiling. Begin testing the potatoes for doneness when the eggs are done, at about 12 minutes.